This round outdoor accent table features an inlaid tile mosaic top in a deep cobalt blue color scheme. 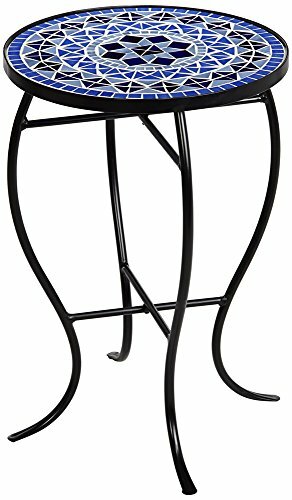 The frame and curvaceous legs are constructed of black finish iron that will withstand the elements. A great way to add fresh style and function to your porch or deck. - 21" high x 14" wide. Weighs 7.25 lbs. - Round outdoor accent table from Teal Island Designs. - Cool blue tile mosaic inlay top. Black finish metal construction. Graceful curved legs. - Designed to be outdoor safe and rustproof. Cool blue tile mosaic inlay top. Black finish metal construction. Graceful curved legs. If you have any questions about this product by Teal Island Designs, contact us by completing and submitting the form below. If you are looking for a specif part number, please include it with your message.